Helen Donnell and her purebred Arabian gelding, Stattok (affectionately called “Stat”), are a team in the world of Eventing, writes Karen Foley. Stattok is sired by the multi-National Champion Stallion *Padron’s son AAF Solitaire, who was out of the Topol daughter *Statistika, lines that are well known for athletic ability. His dam, Z F Desiree by *Napitok+, produced a multi-National Champion in Hunter Pleasure, and a multi-National Top Ten winner in English Pleasure & Pleasure Driving. *Napitok was Canadian National Champion Park Horse and is the sire of many National Champions in English Pleasure, Country English, Show Hack, Hunter Pleasure & Pleasure Driving. Z F Desiree’s dam was RO Fanciray, dam of Multi-National Champion Park Horse Zodiac Matador+.Together they prove that having the courage of your convictions is often the definition of true courage. Training Level Dressage test in 2010. Eventing competition consists of three phases: Dressage, Cross Country and Stadium Jumping. The first phase, Dressage, demonstrates the horse and rider’s ability to perform a series of prescribed classical movements on the flat in an enclosed arena. The second phase, Cross Country, requires the horse and rider to gallop over natural, usually gently rolling, terrain, jumping a variety of fixed obstacles along the way. In the final phase, Show Jumping, horse and rider jump a series of stadium fences in an enclosed arena. The rider accumulates penalty points in each phase based on a variety of fault factors, and the rider with the lowest amount of points at the end of the three phases wins the day. The sport evolved over time from a military contest to an Olympic event. It is a fascinating sport that attracts competitors that range from serious amateur riders to professionals; Olympians and international stars. At the highest levels the sport is dominated by professionals riding Warmbloods, many of which trace back to horses of Arabian and Thoroughbred blood. The sport of Eventing requires commitment and preparation. It takes years for a horse with great natural ability to reach the highest levels. Of the sport’s three phases only one, Dressage, is the least bit subjective. Elapsed time on the cross country phase is what the measure is. Elapsed times and fault penalties during a Stadium Jumping round are what counts regardless of breed. Alternatively, one dressage judge might score one ride a bit different than another dressage judge evaluating the same ride. But the difference in score will not be a significant percentage. 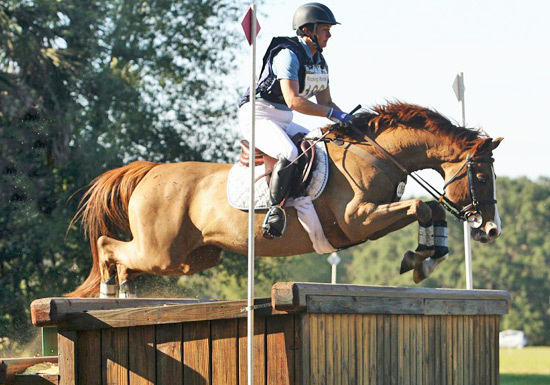 While Eventing has six levels, from Beginner Novice through Advanced, the majority of riders will never ride above the lowest level, Beginner Novice. As a rider moves up through the levels there are fewer and fewer competitors at each subsequent level. The United States Eventing Association (USEA) defines the Preliminary Level as “a moderate examination of competitors and horses in a regular training program preparing for one star events.” In order to compete at Prelim, the rider must qualify. Helen and Stattok began their journey together back in 2007 when Helen took Stat on as a resale project – intending to get him going and send him on to another rider. The rest of their six-year journey is, as they say, history. Whether it is determining that a much-lauded jumping trainer was “not all that,” or a well-respected clinician’s assessment of her little horse was just plain wrong, Helen has made her own choices. Even after Olympian and international competitor, clinician, and author Jimmy Wofford said that Stat was not capable of horse striding and therefore could not make the distances, Helen was not deterred. Moving forward after that kind of pronouncement takes courage. While Helen and Stat’s journey has been littered with obstacles and wrong turns, she has managed to keep her eye on the goal and achieve progress proving once again that it is all about the journey. Helen and Stat schooling over a ditch in 2008. Denny Emerson is known to many in the Arabian horse world as a man with a Tevis Cup belt buckle. Many do not know that Denny was named one of the 50 most influential horsemen of the 20th Century by the Chronicle of the Horse in 2000. He is also the only rider to have won both a gold medal in Eventing and a Tevis Cup buckle. Where I live his name is whispered with the appropriate reverence. He is as much well known for his personal accomplishments as for his generosity to students of the sport of Eventing. This experience makes Denny uniquely qualified to comment on the capabilities of horses for the sport of Eventing. On the other hand, a capable yet poorly trained horse of any breed competing anywhere and at any time perpetuates a negative perception of the particular breed’s capabilities. An Arabian-bred horse presented with a face coated in grease and not prepared for the task at hand is going to perpetuate a negative stereotype. While each horse breed has its own unique man-made issues related to competition, perhaps no horse is so misunderstood as the Arabian. This is largely due to the general public’s lack of knowledge about the breed and the perpetuation by some of the negative stereotypes of the breed. Personally, I would prefer the breed to be underestimated, and therefore have the opportunity to “WOW!” rather than the other way around. Cross Country schooling in 2009. While there are Arabian horses who are made to do the work it can be, as Helen says, “frustrating to try and track real sporting performance among Arab bloodlines” for the purpose of athletic competition. of the offspring of a stallion that has been fitted with weighted shoes or taught a way of going by using techniques that make most practicing true horse people cringe, is nearly impossible. exercise. When Helen needed help with her stadium jumping she looked for quite a while for the right help. Finding a coach for any of the phases can feel impossible at times. Stadium Jumping is Stat and Helen’s most challenging phase, and it seemed for a long time that a coach was not to be found. Helen tried out several jumping coaches before finding the right one, and also found that even though she had some enthusiastic recommendations, the coaches she tried just could not help her. This kind of movement works for endurance. But it “cannot coil up and push off with vertical power,” which is an absolute must for successful dressage and jumping. Helen and Stattok’s Fitness, Strength Training and Conditioning Schedule:“Gallop day” is 20 min walk, 20-30 min trot, then 3 sets of 4-5 min canter/galloping at prescribed speeds, with 2-3 min walk breaks between. Walk and trot on the roads in their neighborhood, currently doing galloping in a neighbor’s hay field. Ends with 15-20 min walk to cool out and get home.Showjumping schools are now mostly at their coach’s barn. Time permitting, they hack over and back, 30 min each way of walk and trot. Actual jump work varies – gymnastics, courses, or focused work on a particular line/distance like triple combinations (which are tricky since the distances are set for horse strides – but Stat has learned how to do them). Overall conditioning – 1-2 days a week they go for a hack/trail ride. 1.5 to 2 hours, half or more in trot. Depending where they go, gallop day and/or trail day will include 20 min walking on asphalt, a key part of keeping his stifles strong. Eventing with any horse is not for the faint of heart. Even the most talented natural athlete, horse or rider, probably will never make it past Beginner Novice. You cannot send an Eventing horse to the trainer in February and have it winning blue ribbons in June. Progress with the three phases of Eventing requires serious, committed work with often slow and sometimes discouraging rates of progress. Both the horse and rider must be prepared and capable. Horses with the right amount of natural talent for the sport often don’t make it to the highest levels because they are missing that something extra called heart. about talent, training and heart. “Fitness and strength are huge factors often overlooked by those who have not played in the big leagues,” says Helen. develop the strength to do the work requires patience, discipline, commitment and time to do the work required for success. An Eventing horse needs to be prepared for almost any possibility. A waving flag or horn going off cannot deter the horse from its job on the day of the Horse Trial or Three Day Event as disappointment or catastrophe will ensue. This is something Helen knows something about. “At Stat’s first schooling show, [competing] Training Level 1 and 2, he was terrified of the white vinyl rail. We did the entire first dressage test without getting within 10 feet of it.” After that experience it was abundantly clear there were holes in their training and Helen found a new coach. 90 seconds (35 penalty points) exceeding the optimum time and not more than 16 penalties at obstacles in the Jumping Test. Being prepared to compete requires an ongoing commitment of time and resources. You have to begin preparing months in advance to be ready for the event. Back in November, Helen told me “I’m going to push myself to get back to 5 days a week riding with the aim of getting us fit enough to run Prelim in February.” A typical rider finds it hard to stick to the boring stuff of working on the basics, and training for strength typically means work outside of the arena. he’ll also stop catching his stifles.” This had been an issue for Stat and the plan worked. in the process improve their times and distances. Sometimes the progress flows and sometimes it stalls. This article first appeared in the The Arabian Sport Horse magazine, and is reprinted here with permission.